Exclusively designed for adults, this charming hotel is in Abu Dhabi. Located within 1000 metres from the town centre, the accommodation allows easy access to all this destination has to offer. Guests will appreciate the property's proximity to the main entertainment areas. Guests can find the nearest golf course within 20. 0 kilometre(s) from the hotel. The nearest beach is within 1000 metres from the property. Visitors will find the airport within 40. 0 kilometre(s). The property consists of 68 guests rooms. Those staying at this hotel may keep updated thanks to the Wi-Fi access. Customers will appreciate the 24-hour reception. La Residence offers a specially designed family room including a cot for children. Guests will not be bothered during their stay, as this is not a pet-friendly property. Featured amenities include a business center, express check-in, and complimentary newspapers in the lobby. Planning an event in Abu Dhabi? This hotel features 646 square feet (60 square meters) of event facilities. Take advantage of recreation opportunities including an outdoor pool and a 24-hour fitness center. This hotel also features complimentary wireless Internet access, gift shops/newsstands, and tour/ticket assistance. Located in Abu Dhabi, Centro Capital Centre is in the business district, a 2-minute drive from Abu Dhabi National Exhibition Centre and 9 minutes from Sheikh Zayed Grand Mosque. 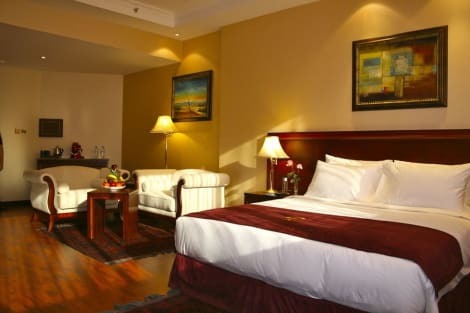 This hotel is 5.9 mi (9.4 km) from Khalifa Park. Located in Abu Dhabi, Centro Yas Island is within a 10-minute drive of Yas Marina and Yas Waterworld. This family-friendly hotel is 2.5 mi (4 km) from Ferrari World and 3.9 mi (6.3 km) from Yas Mall.